Nottingham Food Lovers: Bakewell Tart or Bakewell Pudding: Which is best? And what's the difference between? Bakewell Tart or Bakewell Pudding: Which is best? And what's the difference between? Mr Kipling make's exceedingly good cakes and makes dreamy looking Cherry Bakewell's too from which the light glistens off the icing sugar top. However Mr Kipling's Bakewell's are not actually from the picturesque Derbyshire town of Bakewell less than an hours drive from Nottingham and divert from any traditional recipe by offering an icing sugar topping. Also many people out there may not actually have heard of a Bakewell Pudding- let alone know the difference. If you're in the Peak District it's worth a trip out to Bakewell to test both tart and pudding to see which is best. What's the difference between a Bakewell Tart and a Bakewell Pudding? Bakewell Puddings are made using flaky pastry. Medium Bakewell Puddings from The Old Original Bakewell Pudding Shop, Bakewell. 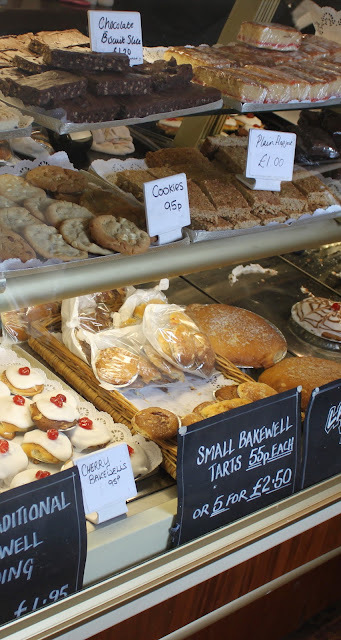 If you're off for a trip to Bakewell there are four main places you really need to visit and sample traditional Bakewell's: The Bakewell Tart Shop and Coffee House, The Old Original Bakewell Pudding Shop, Bloomers of Bakewell and The Bakewell Pudding Factory. Taste Test: The Bakewell Pudding Factory Bakewell Pudding. Eating a traditional Bakewell Pudding is quite a messy experience. As you can see from the photograph above there is a large amount of visible flaky pastry which is soft yet seems to go everywhere and adds a dry outside to the Bakewell pudding. The central section of the Bakewell Pudding is succulent and moist. The Jam layer spread on the base prior to cooking has migrated up through the centre mixture to provide moisture and a distinct flavour throughout the centre of the Bakewell Pudding to provide a unique taste throughout the filling of moist almond and strawberry jam. After visits to all of the Bakewell Pudding makers in Bakewell, Derbyshire we plumped for the produce of he Bakewell Pudding Factory as we walked in and were really impressed by their counter and the options we had available and their Bakewell Tarts and Bakewell Puddings looked the least commercially produced. Their appearance was much less uniform than those of other establishments. From personal experience good food and cake doesn't have to look like perfection as the taste is what makes the real difference. Which is best? A Bakewell Pudding or a Bakewell Tart? As a cake lover it's hard to make a preference. The consistency of a Bakewell Tart throughout with it's uniform shortcrust pastry is hard to beat on a purely visual standpoint however in terms of taste the migration of the jam up through the filling which happens in a Bakewell Pudding during the baking process results in a uniquely moist flavour that has to be experienced with a trip to Bakewell and the Peak District. If ever I'm in Bakewell I'd choose the Pudding every time! Both are delicious, but I prefer the tarts.